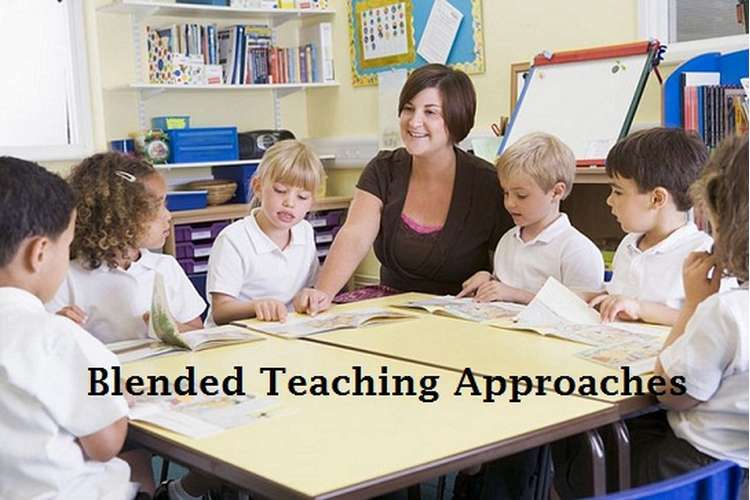 "Teaching using a blended approach – what does the literature tell us? " Post that, this paper will attempt to check for the “principled alignment among the epistemological positions, relevant theoretical frameworks, approaches to research, research methodology and strategies for collecting, analysing and interpreting data” (Kamberelis & Dimitriadis, 2005). Though the four dimensions of ETAS framework may influence each other in a non-sequential, cyclic way with multiple iteration before the research is concluded, the general understanding is that a researcher’s epistemological position is the starting point of a research which dictates the choice of theoretical framework the researcher chooses to adopt. This corresponds to the ‘E’ dimension of the ETAS model. Once a relevant framework is chosen, corresponding to the ‘T’ dimension of the ETAS framework, it guides the researcher’s approach in research, which ultimately results in the adopted strategy to actually collect, slice and dice the data, analyse it and reach a conclusion that paves the way for further research. Thus, for this paper we will adopt a sequential approach even though in practice, the affects may be in any order except the relation between epistemology and theoretical framework in that the epistemology can guide the selection of theoretical framework of evaluation and not the other way round (Crotty, 1998). The research paper on blended teaching approaches by Gebric (2011) is different from other researches on the topic in a couple of important ways. First of all, unlike most researches, this paper is not a primary research i.e. it does not derive its conclusions from first-hand information collection and then analysing the collected data to reach the research objective. Rather, this is more of a secondary exploratory study that uses previously published research articles in teaching literature, performs an exhaustive literature review and then organises the information obtained in a structural manner to aid the reader in deriving their own conclusions. Secondly, most of the literature available on the topic of blended learning is from the students’ account and very less research has been conducted from the perspective of the teachers (Gebric, 2011). The research paper indicates two areas of development in the field of blended learning from the teachers’ perspective i.e. their beliefs and conceptions about blended teaching and the changing roles of teachers due to the advent of information and communication technologies that enable blended teaching. The paper starts by noting down how blended learning has seen an increased adoption rate in the last twenty years and then explores various definitions of the term ‘blended learning’. Though the author does not settle for a formal definition for the context of her research, the general idea one gets about the term ‘blended learning’ is that of an integrated learning environment where a mix of face-to-face interaction and online learning enabled by information and communication technologies result in holistic learning for the student. However, this presents challenges for the teachers designing the pedagogy and how to balance the time between the face-to-face interaction and online learning in order to reap the benefits of modern technology enabling self-paced, multimedia aided learning in an engrossing environment that pervades the regional and cultural boundaries, without losing out on the opportunity of developing a personal connect with the students enabled through face-to-face interaction that allows in a more personalised attention and tracking the student’s learning progress. The author then delves into the lack of availability of literature from the teachers’ perspective on the topic noting that except for a couple of valid literature pieces, most research is either from students’ perspective, teachers’ account of exceptional student achievers cases or address only one medium of learning impartment. This limitation apart, the available literature was reviewed and two themes i.e. teachers’ conceptions of blended learning and changing roles of teachers in a blended learning environment were identified from the available body of knowledge. Finally, the author wraps up by saying that technology is not going to make teachers irrelevant and that teachers are going to play an important role in the time to come however, they need to embrace the changing environment, identify their changing roles and adopt technology. The changing environment presents both challenges and opportunities for teachers and the ones that have been able to identify these and act on the same have been the ones that have made the most out of what the technology has to offer. Technology and teacher are not an either-or option but more of an ‘and’ that will use the best of both worlds in creating an integrated learning environment encouraging a freer exchange of idea and a more open interaction among online communities. Teachers however need more time to accept this changing reality and further research is needed in this area to come up with more detailed insights. In social science, the two prominent lines of enquiry are objectivism and constructionism. The paper’s title itself suggests that the line of enquiry is on the teachers’ perception on blended learning approaches thus perception is a major factor of the paper and the line of enquiry is clearly constructionist. Constructionism, by the very definition implies that a single event, object or process can be interpreted in different ways by a different people and all these individual interpretations can be correct in their respective contexts. The paper further enhances its constructionist approach when the author lists down the different attitudes and changing roles of teachers in a blended learning environment and all of those are explored individually. The paper itself is also of constructionist nature as the definition of blended learning is also set in the context of the exploratory research. Though the author admits in the conclusion that further research is needed to come up with a theoretical framework for establishing the basis of additional research and expanding the body of knowledge, if we have to choose from positivism and interpretivism, two theoretical approaches in evaluating qualitative and critical analysis, the article is clearly interpretivist as the agenda of the research is to interpret teachers’ beliefs and conception of a changing environment. Additionally, the research itself is not first hand and bases its conclusions on previously conducted researches on the topic and tries to extract relevant information, with proper caveats in place and interprets the conclusions of the prior body of knowledge in reaching its own conclusions. Though no formal theoretical model is proposed by the author, the paper does try to categorise the teachers’ beliefs and perceptions and changing roles, the two branches of exploration identified from the literature review, into different groups and provide the relevance and the reasoning behind those perceptions. The paper also tries to come up with the challenges and opportunities presented by the changing roles and possible strategies for teachers to make the most of the changing teaching dynamic triggered by the information and communication technological revolutions. This approach, though not a very well defined structurally, does fit in with the definition of a research approach being “Approaches are systematic yet dynamic (i.e., changeable and changing) social scientific formations that provide loosely defined structures for conceiving, designing, and carrying out research projects” (Kamberelis & Dimitriadis, 2005). “Research strategies are the specific practices and procedures that researchers deploy to collect and analyse data and to report their findings.” (Kamberelis & Dimitriadis, 2005). The author clearly mentions in the beginning of the paper the lack of a proper body of knowledge on blended learning from teachers’ point of view. The paper further cites the difficulty in using the existing literature for the purpose of this study. Thus, the obvious choice of choosing the data for analysis was a search through existing literature using proper keywords and performing a literature review to arrive at the conclusions of the research. The author does point out the limitations of this research and suggests further steps to expand the understanding in this area of research. It is important to have a principled alignment between the four dimensions of the ETAS framework else the qualitative enquiry will not hold true to criticism (Kamberelis & Dimitriadis, 2005). The earlier section of the paper already mentions that a sequential relationship will be assumed to evaluate the principled alignment. The epistemology being constructivist, it is no wonder that the theoretical framework is also interpretivist which is also in line with Crotty (1998). The author tried to categorise the different conceptions and changing roles available from existing literature and attempted to explain the reasoning behind the same and their effects. Having informed the reader about the paucity of relevant research available in the area of enquiry, one would come to expect a first-hand collection of data. However, we do not know the operating constraints of the author thus the strategy of secondary research, though not very intuitive, does seem appropriate. However, the sequential flow assumed in the beginning of this paper seems to be broken and the actual flow in the paper turns out to be Strategy -> Epistemology -> Theory -> Approach, which is in line with the foundations of social research (Crotty, 1998) and thus we can say that a principled alignment between the four dimensions of the ETAS framework exists in the author’s research. This section tries to identify the primary location of the author in the chronotopes framework i.e. Though it is not necessary that the entire article will be operating within one chronotrope, the primary argument tends to be in one of the four chronotropes with hints of one or more chronotopes visible in one form or other to support the main argument. A quick glance through the paper is enough to tell the reader that the author is operating in C2 i.e. the chronotrope dealing with reading and interpretation. The main focus of the paper is to collect available literature on the subject of enquiry, sift through it to identify the relevant and the non relevant pieces, going through the body of knowledge identified as relevant to the subject and interpret it to arrive at conclusions that paint a coherent picture of the situation at hand. Most of the paper focuses on extracting research information from available literature and classifying it for the purpose of analysis. A hint of C1 i.e. the chronotrope dealing with objectivism and representation is also visible in the paper since the author is trying to classify the different conceptions of teachers on the subject of blended learning, and the changing roles of teachers in light of the new dynamic, identified from the interpretation of available literature. Further the author tries to come up with the reasons for the different behaviours identified from research and attempts to extend those. Not only the reasons, the author also aims at finding the most important of the conceptions and changed roles and analyses the effect of these on the learning experience of students. The chronotrope C3 deals with scepticism, conscientization and praxis. In the final section of the paper, the author has listed down the limitations of the research and has suggested action points for further research such as using a more representative sample of teachers, including the new age teachers i.e. the generation that was born after the information and communication technology revolution and are now in the field of teaching, including experiences from the developing world etc. Since the author attempts to list down the action points for further researchers as well as teachers based on existing knowledge and interpretation, this is an indication of praxis and thus, C3. Therefore, from the chronotropes framework point of view, it can be concluded that the primary operating chronotrope of the author’s mind during the paper is C2 (Reading and Interpretation). The author, at times, does delve into C1 (Objectivism and Representation) and C3 (Skepticism, Conscientization and Praxis) too. However, no trace of C4 (Power/Knowledge and Defamiliarisation) could be found in the paper. Crotty, M. (1998). The foundations of social research: meaning and perspective in the research process. Australia: Allen & Unwin Pty Ltd.
Kamberelis, G., & Dimitriadis, G. (2005). On Qualitative Inquiry: Teachers College Press.